SinfulColors Announces Collaboration with Kandee Johnson; Introducing Two New Collections By Celebrity Makeup Artist and Vlogger. 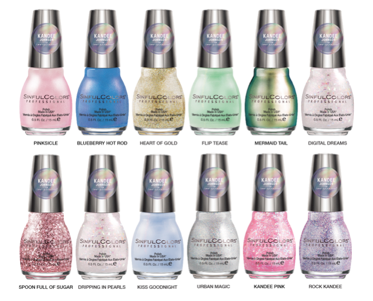 SinfulColors teamed up with celebrity makeup artist and vlogger Kandee Johnson to create two limited edition collections – Pretty Vintage and Vintage Anime. Here's an NOTD that I wore for a full week. Simple stamping over a complex polish makes my heart a flutter. I love this so much that I'm ready to put it back on! Good evening! Tonight I'm sharing a new series I've created for my blog! Pusheen the Cat is a cartoon cat that I think is just the cutest! For the past three years, my boyfriend has gotten me the calendar and each month, I think about how cute it would be to draw the calendar's month on my nails! Well, 2017 starts this tradition. I just barely made in January, but I ready to start this series! Pusheen started January chock full of donuts, because she doesn't believe in diets! How cute! Road to Polish Con: Girly Bits Budget? Fuggedaboudit! I'm back with another Polish Con polish! These polishes are part of a series leading up to the Polish Con event, happening April 29th, in Brooklyn, NY. Girly Bits Budget? Fuggedaboudit! is available starting tomorrow, for one week only, so if you want it, don't hesitate! Hello lovelies! Girly Bits has just been knocking it out of the park with her 2017 releases so far. Yes, I know, we are only into January, but this duo is really lovely! Just for the January CoTM, it will be available through the end of February, so let's check it out! Hello! If you didn't know, there will be an awesome convention of over 30 indie brands! I had to miss the one in CHicago in September because I had planned my father's surprise birthday party a year before! The Polish Convention happens twice a year and in April, it will be in Brooklyn. Seeing as I Live in NYC, you know I'll be there! I have the privilege to show you the exclusive Road to Polish Con polish from KBShimmer. Velvet 59 is a company I met with at Cosmoprof North America this past summer. I had never heard of them but they have an array of makeup palettes and they were focusing on their newest palette, Rose Metals. I've been playing around with this palette and wore it a few times, so now I can finally share my review! I'm back with some more faux water marbling, the best kind of water marbling. Born Pretty has really stepped up their stamping plate game, so I'm back with more to show you. I clearly loved the celebration plate, as I used it for 3 posts, and now I have another great post! A little NOTD today. Today features a special gift from Jen at My Nail Polish Obsession. She knows I am an avid Gilmore Girls fan and so she spent me this polish inspired by the series. I'm wearing it today because it's my mother's birthday, and we watched the show since the first episode aired on WB so many years ago. While I was away at college, she would videotape the series and we would binge it when I would come home! So happy birthday to my mom! We may be mid-winter, but Zoya is releasing information about their Charming collection for Spring 2017! Click below for more info! I can't believe we are halfway through January. My courses start back up in just one week. Where did my break go?! Anyway, as I finish syllabus creation, and we now enter the real beginning of winter, I'm craving some bright cremes. Glisten & Glow released a set of four bright cremes over the summer and I have two to show you today. Good morning! 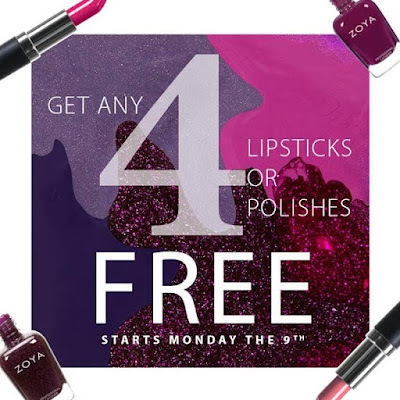 It's the weekend but I wanted to share three new Zoya lipsticks while the New Year promo is still going on! These retail for $12 but right now (until January 16th) you can get 4 for $15! If you like lipsticks, then you need to check these out. If you're into nail art and stamping, you've definitely seen these silicone mats to practice on. What's great is that they have nails on them and are easily cleaned with nail polish remover. Born Pretty has a bunch of these mats, and now in a variety of sizes. Today I'm sharing a mini mat, and what's cool is that it has black areas to see what shows up and what doesn't! Remember Borghese nail polishes? Oh man, I loved those and I still have a few like the highly sought after Almondine and others. I stopped by this booth while at Cosmoprof and we chatted about the old days and polish. Borghese no longer makes nail polish but now they have a ton of skin care. I didn't post about them right away because I wasn't aware of availability. Well, I happened to see this brand at Macy's, so now I'm going to share since I love these products! I also noticed Macy's has a ton of sales on these products, so it's a perfect time to show you. Good morning! Today I have a new series from 6 Harts! Each month, Courtney, the genius behind 6 Harts, will be creating 1-2 polishes inspired by the strong women around her. This is the first of the series and they will be released on January 14th. You know I'm all about the Zoya comparisons. I have a huge collection and I like being able to do comparisons whenever possible. I decided to separate out the post from yesterday's swatches. Since this is the third Naturel collection, I dug out some old ones to do a little comparison! This will help you decide what to grab during the 4 free sale! It's a new week and I'm hoping that I'm cleansed of this yucky sickness. I wanted to get up the Naturel (3) collection because as you saw in my previous post here, there's an excellent deal starting today! Get any four polishes free, just pay shipping! And the Naturels are a great transitional collection before we move into spring. Another post tonight, since I actually have a little life in me to post. Blah, I need to get over this cold! Thank goodness my current mani is holding up because I can't handle doing my nails. Now, tonight I'm showing Astoria, which my mom has been wearing for over a week! I wore it a few days before I had to changed my mani. This polish is absolutely amazing, so let's check it out. Zoya New Year Deal: Get 4 Free Lipsticks or Nail Polishes! Hi all! Sorry for my little absence as I finally got hit with that Northeast cold that has been going around. I feel like junk but I wanted to let you know about this awesome Zoya deal for the new year! Today I'm sharing 4/8 of the newest collection from KBShimmer, the Office Space collection. It has nothing to do with the movie, but is about fun neutrals you can wear to work! I'm currently rocking one as my manicure, and I can't stop looking at my nails! So let's see them! Hello all! I took a cue from my first post of 2016, and decided I wanted to do similar nails! I reversed the color of my base because the moment I swatched KBShimmer Whiskey Business, I knew it had to be my New Year's Eve manicure. It's just the perfect gold polish.